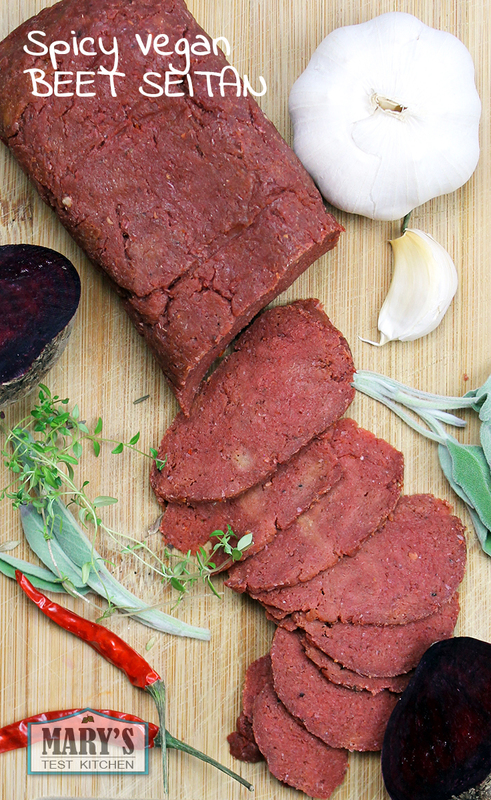 This spicy seitan gets its red color from beets. The combination of spices in this recipe are similar to those you might find in pepperoni, giving this seitan a hearty, smoky flavour that is great in sandwiches, stir fries, and other savory dishes. I was just trying to use up the beets that had been sitting at the bottom of my refrigerator for a few weeks. I go through phases with beets: sometimes I love them, sometimes I hate them. Sometimes beets are sweet and other times, they have a strong earthy flavour. And by earthy, I mean they taste like dirt. 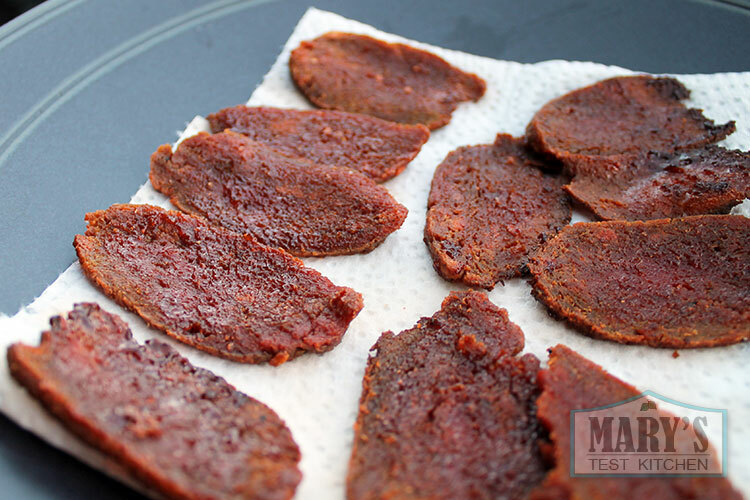 So after cooking with this batch of beets and just not liking the flavour at all, I decided to utilize the nutrients and the color in them and hide them in a spicy, flavourful seitan. I was pretty happy with the results but tested it a few more times with various adjustments. 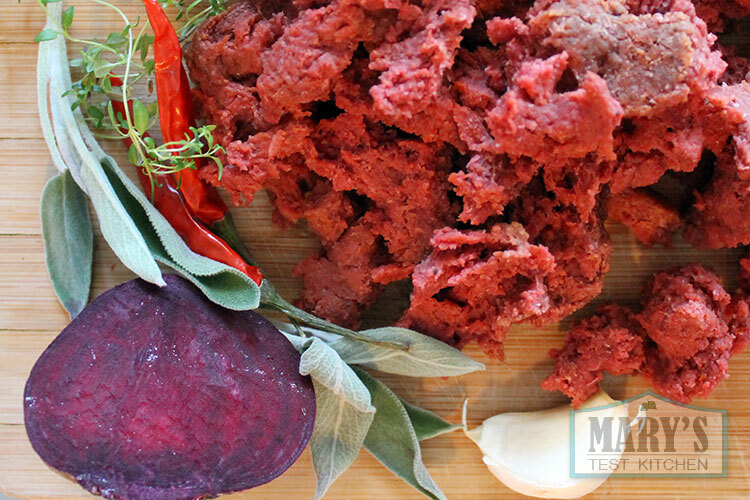 The result is this spicy beet seitan recipe. I like to make recipes as simple as possible. For this recipe, all you need to do is blend up your ingredients and combine that with vital wheat gluten to form a firm dough. You can steam the seitan or bake it. Each method results in a different texture. Steamed seitan is firm and easy to slice. The starch from the beet makes the bite a bit softer than my beefy beefless seitan or simple savory seitan for sandwiches. It is nice plain but it is really spectacular when you fry it up with a little oil to make the outside a bit crisp. 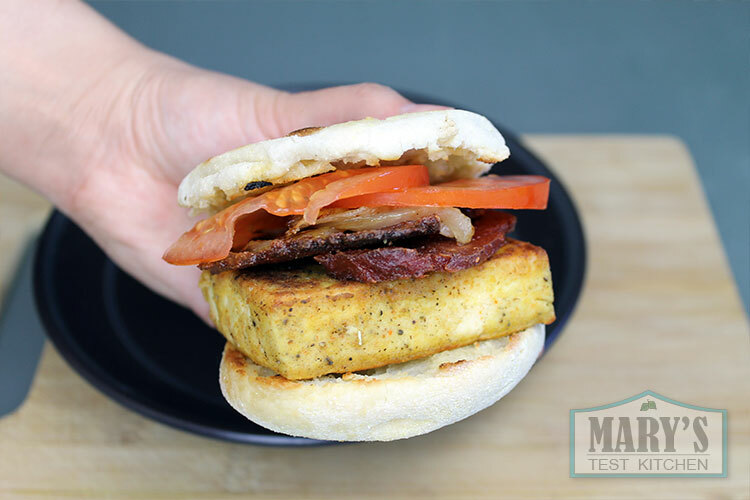 Brush it with one part maple syrup and one part BBQ sauce and you have a great crispy, smoky, sweet and salty filling for a breakfast sandwich or just to eat on it’s own. You could use this seitan where one might’ve used bacon in their pre-vegan days but keep in mind that they are two totally different things. Three and a half years into eating a plant-based diet, the thought of “bacon” doesn’t appeal to me in the least. But this “seitan bacon” is drool-inducing and totally worth the time it takes to make. If you bake the beet seitan and let it cool, you can pull it apart with your fingers to create pieces that are great to use in stir-fries. The texture of the baked version is softer and chewier than the steamed version and retains the gluten strands. Like my beefy beefless seitan, this seitan is meant to be a starting point to make even more delicious foods. 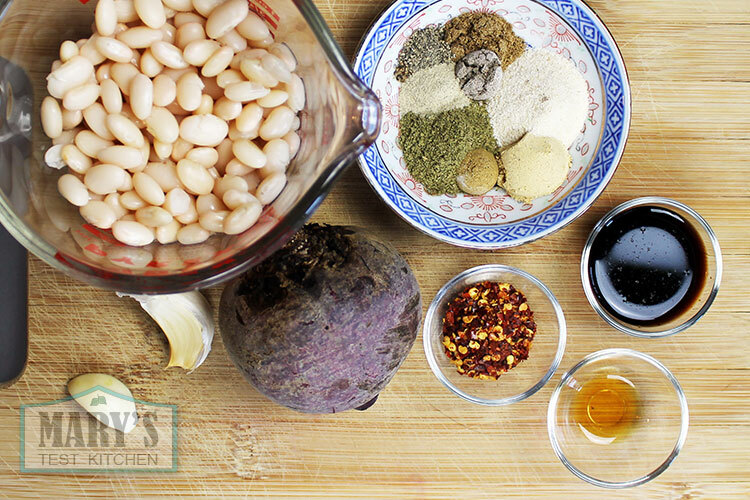 You can enhance the seitan by adding sauces or glazes and baking it further, sauteing, or frying. How would you use this seitan? Does the color and texture freak you out or do you like that kind of thing? I’m on the fence about that part but I have to say, it tastes amazing. 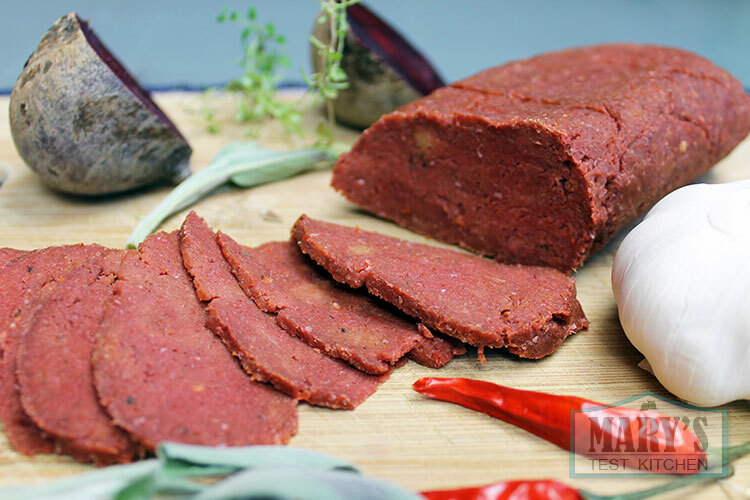 This spicy beet seitan blends herbs and spices that one would find in cured products such as pepperoni to create a smoky hearty flavour. Deep red beets add the slightly disturbing color but also healthy nutrients like B vitamins. 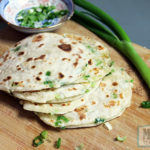 You can fry it up and brush it with maple syrup for a smokey salty chewy and crisp addition to a breakfast sandwich or stir fry with onions and sweet BBQ sauce to top noodles or rice. The possibilities are endless. 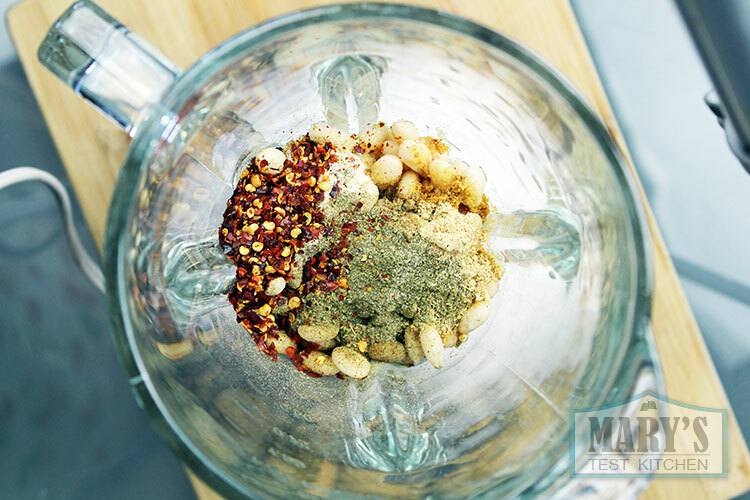 Blend all the ingredients EXCEPT for the vital wheat gluten in a blender until fairly smooth. 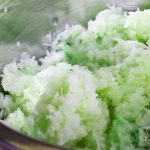 Transfer the puree to a large mixing bowl and add the vital wheat gluten. Mix until it forms a dough. With clean hands, knead for one to two minutes. This step develops the gluten strands which creates texture in the final product. Steam or bake the seitan as below. Shape the dough into a log shape and wrap in parchment paper. Simply roll it up in the parchment and fold the two ends under the loaf. Steam over high heat for one hour and fifteen minutes if you are cooking the whole batch in one loaf. For a half batch, steam for only one hour. Remove from heat, remove the parchment and let cool until just warm. Then cool completely in the refrigerator before slicing or cutting into cubes. This seitan is now ready to eat or use in other dishes. Prepare a sheet of aluminum foil by oiling the shiny side. Leave a couple inches at the side un-oiled. One piece of dough in the middle and roll it up in the foil. Fold the two sides under the roll and the edges to seal. Repeat with the other half of the dough. Bake in a preheated oven at 350F or 180C for one hour on the middle rack, turning every 20 minutes to ensure even cooking. Remove from the oven and let cool for a half hour. Then place in the fridge to cool completely. Unwrap the foil before slicing or pulling apart to create chunky pieces. This seitan is now ready to put into stir-fries or toss with glaze and bake again to make the seitan a little crispy. This seitan is intended to be a starting point. Once you've prepared this, you can fry it, saute, glaze and bake or use another method to enhance it. For maple glazed seitan "bacon," slice the seitan into strips. Then fry it in a little oil over high heat. Before flipping the pieces, brush on a thin layer of glaze made from one part maple syrup and one part barbecue sauce. Cook until browned or as crispy as you desire. I’m completely obsessed with your youtube channel and have already watched all videos in less than a week (in detriment of many school obligations…lol). I’d like to know how and for how long we can store the cooked seitan. Thank you and please keep posting! I used shichimi, a smoked hickory flavoring mix, smoked paprika and mixed herbs. Waiting to finish baking. Can’t wait to taste. Not keen on cooking with foil so am using baking paper. My dough didn’t look or feel as firm as yours in the video so I added some more gluten. Hopinf for the best! It might be because I accidently put in slightly more water than I should have…what do I do? That sounds fine; adding extra gluten if you added extra water. I would just try to add a bit more flavouring if it was a bunch more water+gluten. Also, if you have a soggier dough, you may want to stick to the baking method as that will draw out some moisture. Good luck! This looks amazing! I’m so eager to try this out. Can I use regular flour instead of the vital wheat glutten? Would can I substitute it with? Thanks for the kind words, dear. Vital wheat gluten is actually vital in this recipe. You see, regular flour has only about 10% gluten while Vital Wheat Gluten is about 80% gluten. There is no substitute. This came out great! The second time I tried it, I used too much water and it didn’t hold together as well. It reminded of fatty meat in ramen soup from the distant pre-vegan days. So, I tried the seitan fried in ramen soup. Nice combination. This is going into my regular repertoire. Thanks for inventing it! Is it possible to steam this in a steamer instead of the big oven? Or could I just use a toaster oven to cook it? If I use a toaster oven what temperature should I use? I don’t like using the big oven that long lest my energy bill skyrocket! Oops. Never mind just saw the instruction for steaming. It was hard to read on my phone lol. The recipe looks great. Can’t wait to try it. Thanks for the recipe! Glad you found the instructions 🙂 Have fun trying the seitan! I loved this recipe although I did add 3 teaspoons of Marmite so mine might taste a little different. I wasn’t sure if I needed to cook the beetroot so I did lol I probably wasn’t paying enough attention! I used kidney beans in mine and the colour wasn’t as good as yours. I also needed to add more VWG but I might have had a lot of water in my beans or beets. The texture was really good and got the thumbs up from my meat eating husband (although we eat vegan at home). I broke some up into chunks for stir fries and sliced the other batch for sandwiches etc and froze them. Did you ever eat stuffed pork slices or bacon strips in your pre vegan days? I only really ate meat that didn’t have a meaty texture and had lots of flavours added and stopped eating meat and fish altogether at about 14 years old. I remember my mum telling me that I used to like stuffed pork slices and bacon strips and although I can’t remember what they tasted of I was wondering if you would please maybe try to make a vegan version some day? Thanks for the videos and website!